Whether your employees work on-site or remotely, having a well-organized remote on-boarding program allows all newly appointed workers to quickly get familiarized with their new work setting. Today, almost two-thirds (63%) of businesses have remote employees and it is anticipated that in the next ten years over one-third of full time workers will work remotely. While majority of businesses nowadays choose to employ remote workers, many of them struggle to assimilate virtual employees with their conventional on-site staff. Having an effective on-boarding process for new recruits is significant as it enhances worker retention and contentment. Lack of an effective on-boarding program results in businesses being anxious to keep their workers, especially off-site workers, driven and involved. Moreover, companies that employ virtual workforces are also worried about accountability as supervisors wish to ensure that their new employees excel at work continuously. The on-boarding program intends to assimilate new hires with the present workforce and the office setting. 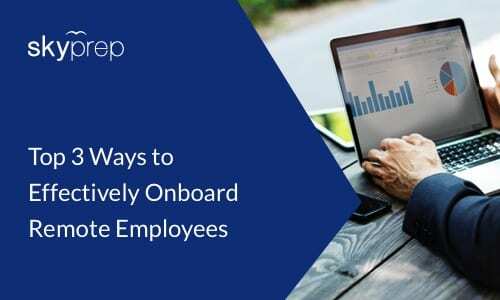 An effective on-boarding process allows employees to meet their colleagues and learn about the in-house corporate procedures that influence their job. Workers are familiarized with their performance requirements and assisted during the process of finalizing their documentation and preliminary training. Organizations that fail to appropriately onboard their new virtual employees pave their way towards letdown. Without an appropriate introduction to their colleagues and work requirements, virtual employees can become disconnected and lost. Conventionally, organizations welcome their new employees in person, offer them an office tour and familiarize them with managers and colleagues. This way, non-verbal gestures of new hires can help supervisors identify if any employee is unclear about something or has a query. However, the process becomes challenging with remote hires. Virtual employees are often located at distant places and even in different time zones. Supervisors with inadequate communication skills and unfamiliarity with technology and the virtual employment model often overlook their responsibility to onboard their newly hired team mates. Being absent physically, virtual employees are unable to quickly evaluate their work setting and adjust according to corporate culture. Moreover, they are often unable to see the individuals they work with. The first step to quickly onboard your new remote employees is to give clear instructions regarding proper procedures and requirements of the organization’s telecommuting policy. It is ideal to provide relevant information to the new recruits prior to their first working day so they can feel welcomed from the day they start working. It is essential for virtual employees to clearly know their responsibilities and have attainable objectives for prospective growth. Thus, your organization must share corporate values along with objectives for teams and their projects. Workers must be aware of when to expect their first performance evaluation and know the basis for their appraisal. Therefore, companies should clearly let their employees know what to expect from them. Meeting face to face can give a great start to your relationship with new hires. Therefore, whenever possible, encourage your new remote employees to visit your office and meet you and your team. In case your virtual workers are unable to visit, make full use of the latest tools and technology such as learning management systems (LMS) to share information or video conferencing to have a face-to-face discussion. You can also get a wireless mobile camera to give your remote workers real-time virtual tours of your site. Using tools such as LMS can reduce the need for travel, thereby, eliminating stress and expenditure. With an LMS your employees, whether on-site or working remotely, can collaborate and share best practices. Moreover, they can learn on the go while you can easily monitor their performance via reporting and analytics. Similarly, conferencing tools such as screen sharing can make virtual meetings more like an on-site one-on-one meeting. So the next time you have a meeting with your office based workers, make sure you involve your virtual employees in it via a video conferencing tool. This will help them feel more engaged with the company. It is important to periodically evaluate the effectiveness of your on-boarding program. Seek feedback from your on-site and virtual workforce and motivate them to share recommendations and inputs. With an open mind, evaluate the program and meticulously consider every novel idea. Consequently, you can rectify any errors in the on-boarding process and discover ways to offer a better experience for all those who are involved. Share your experiences regarding on-boarding virtual employees with your more experienced team mates and learn from their mistakes to quickly develop better practices. Your priority should be to provide every new employee a favorable and pleasant experience with your organization. To successfully onboard your virtual workers, focus on creating open communication channels and practices. Encourage your remote workers to physically meet you and your team, whenever possible. Else, use latest tools and technologies such as LMS, wireless mobile cams and video conferencing to make the work experience more personal and interesting. Stimulate team collaboration and try your best to make the new remote workers feel welcomed. With the three ways mentioned above, you can help your virtual staff remain happy and contented for a long time.